What does the future hold for futurism? Video Kills the Telephone Call? The proliferation of smart speakers has continued unabated nearly since their inception, but recently we’ve seen a new feature taking center stage on these do-it-all devices—video. While the merits of video functionality are readily apparent for smart speakers—users can follow recipes with hands-free commands, check the weather or map routes, or simply catch up on shows while multi-tasking around the house—there seems to be a real push for these video-equipped hubs to replace the phone as the communication device of choice in homes. For Facebook Portal, this is expressly the case, with all other smart speaker features coming almost as afterthoughts to its prime purpose of visual-based communications. So committed to the cause of video chatting is the Portal, that the Portal+ device can recognize users as they move and automatically rotate to follow them, allowing chat participants to remain on screen as they move from kitchen to couch. Setting aside concerns about entrenching Facebook even deeper into your life, how likely is it that video chatting will become the preferred means of communication? Video calls have grown in prominence in professional lives as camera-based calls have allowed for more immersive meetings to take place across great distances, and the growing popularity of live streaming services like Instagram, Twitch and Facebook Live have certainly helped to further inculcate video communication into individuals’ lives. But will younger generations—the ones who need to embrace the medium to make it viable and the ones who have shown a stronger predilection to text-based communication over audio—immerse themselves in video calls? That’s the bet tech is making—even for the devices not tied to our homes. While Apple has not announced plans for a video element for its HomePod, the company has recently upgraded the capabilities of its iOS-based video chatting app, FaceTime, allowing users to communicate with up to 32 people on a call at one time. It remains to be seen if a rise in video communication-capable devices leads to a growth in video-chatting—consumers often don’t use products in the ways manufacturers intended. But even if an explosion of video-equipped smart speakers doesn’t lead to a golden age of people looking each other in the eye while communicating, at least everyone will be able to watch “The Great British Bake-Off” while making breakfast. Throughout their history, smart homes have been defined by the intelligent devices they house. 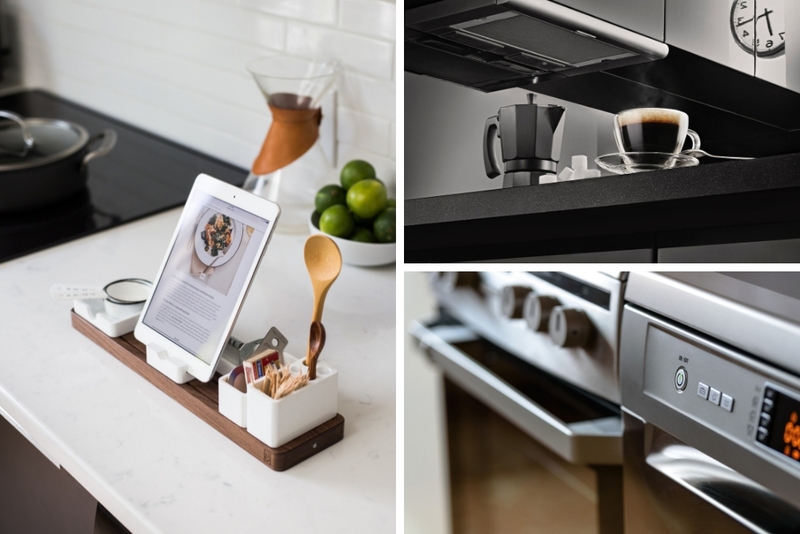 Voice-controlled lighting, thermostats that automatically adjust with the weather, coffee pots that begin brewing when they recognize you’re awake—products that save labor, money or time via automation and connectivity. But what about those tasks for which no single device will suffice? The chores—laundry, grocery shopping, home maintenance—that, short of a robotic butler, will require some manual labor on the part of the homeowner? Brace for the rise of smart services—automated fulfillment of the daily tasks that make an uninterrupted life possible. “Replenishment” is one area where these smart services are already established and we should expect to see further growth. Beyond services built for the express purpose, like Peapod, you may have noticed that nearly every grocery chain of substantial size is offering some manner of automated ordering—and reordering—and delivery, either via an app or website. This process allows customers with a good grasp of their consumption habits to ensure that their homes are never out of their favorite foods, with specific items in specific quantities being automatically delivered at regular intervals. But expect producers to take thinking even further out of the process. Leveraging technologies like Amazon Dash, developers will start programming the household devices to recognize when they are running low on supply and automatically reorder the goods. Like WePlenish, a smart coffee pod container that keeps track of inventory levels and automatically orders more java when needed, so you never have to experience a caffeine-less existence. Will we see the refrigerator that automatically orders tomatoes? Or the soap dispenser that refills itself? The possibilities are endless—and likely, as automated reordering is an activity manufacturers can firmly get behind. But what about the tasks that keep your house running that require some measure of manual labor, like cleaning and maintenance? Here, too, we should expect to see app- and device-based solutions that call in reinforcements with some measure of regular automation when the chores need to get done. Like Cleanly, an app that allows users to schedule pickup and drop-off of their laundry, fresh and folded, within a 24-hour period. The latest version of certain home standards, like washers and dryers, are able to run their own diagnostic programs, identifying errors when they arise—how long before these machines are able to request their own maintenance when need? How long before a pool probe can send out a call when it needs a cleaning? Or gutters can identify when they need to cleared? In addition to the rise of these automated services, we should expect to see growth of the technologies that help facilitate them. Technologies like Ring video doorbells or August smart locks, which can allow homeowners to identify who is at their door—like the Cleanly delivery person—and grant them temporary access to your abode. That is, if a human even delivers your goods anymore. Walmart recently announced a pilot program with Ford and Postmates to examine the automated delivery of groceries via autonomous self-driving vehicles. Likewise, grocery chain Kroger announced a partnership with Nuro to tackle the most difficult task of ordering online, “last-mile delivery”—that is, getting the requested goods from the store to the customer’s home, a feat they also hope to accomplish with robotic drivers. The end result of the endless automation of anything approaching “difficult” should enable individuals to lead lives unhampered in pursuit of their goals—be it extra productivity in matters personal or professional, or the much more noble pursuit of binge-watching Netflix while moving as little as possible. If 2018 was all about inky blue cabinetry with copper and brass accents, what does 2019 have in store? 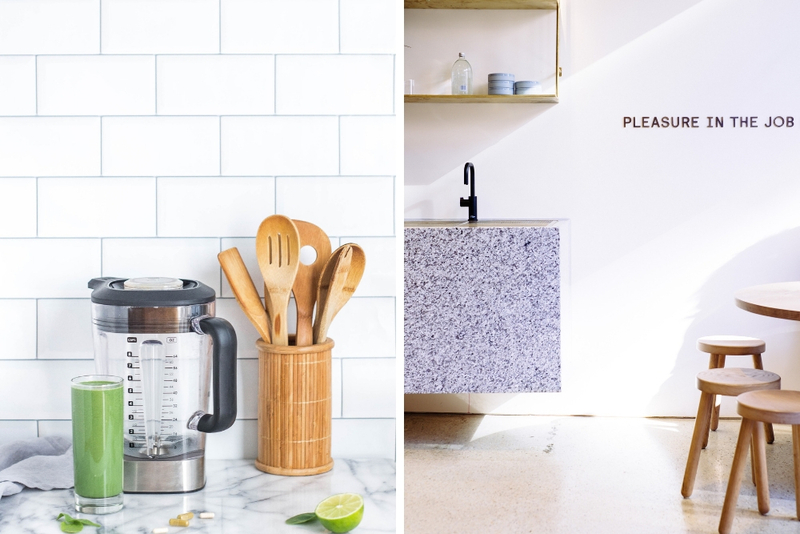 Here’s a look from leading retailers on the biggest kitchen trends for 2019. 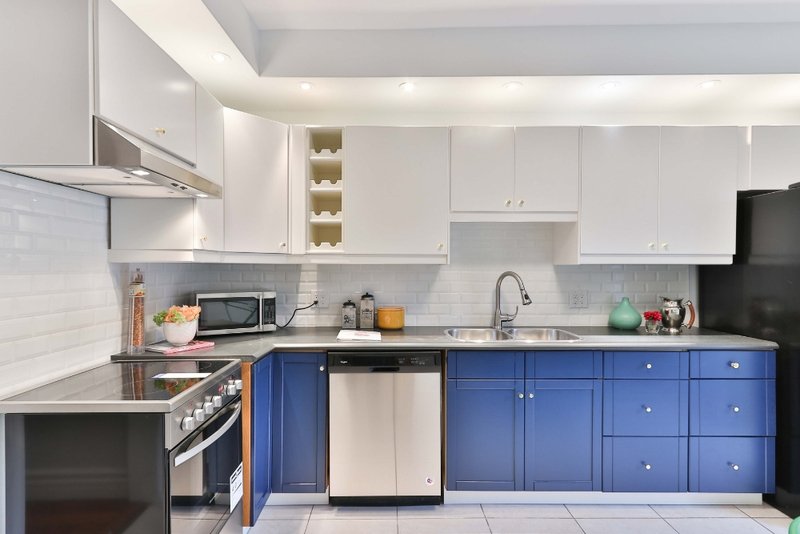 Last year was all about navy, but expect to see more green in kitchens going forward. 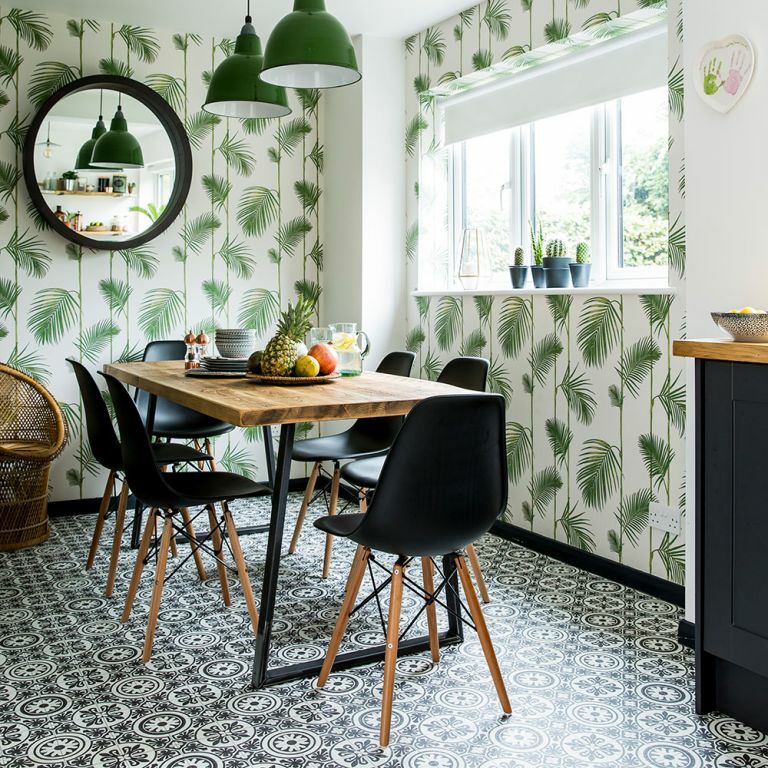 It could be in the form of accents, like this wallpaper – palm fronds and botanicals are to 2019 what florals were to the mid-Noughties. However, it’s increasingly likely to take the form of tiles and cabinetry, in tones of emerald and forest green. 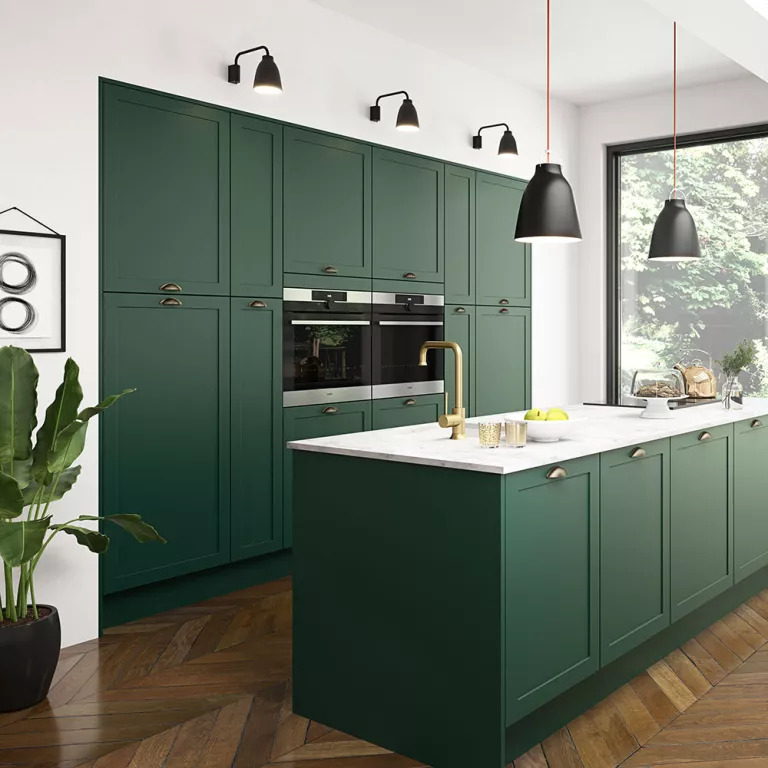 The trend for bold dark hues was prominent throughout 2018, and as we move in to 2019, green kitchen cabinetry is set to be a new, key style. Deep forest greens can be balanced out with latte shades, smoky glass and soft metallics to bring opulence to the kitchen. The addition of white marble and brass through design aspects like lighting and worktops, or even accessories, help to bounce the light around the space and offset the heavier hues. We all know that islands and breakfast bars can provide a spot for casual dining, as well as workspace and storage. This is a look you’ll see in tiles as much as anything, and reflects a wider return to 70s trends within the home. Color wise we will see a strong focus on rich, earthy tones like Mustard yellow, ochre, olive green, chocolate and camels. If this floats your retro boat, a mix of The Winchester Tile Company’s Olive Green, Honey and Amber field tiles could work for you. Pair with retro-patterned wallpaper and fabrics with bold motifs for a real throwback! 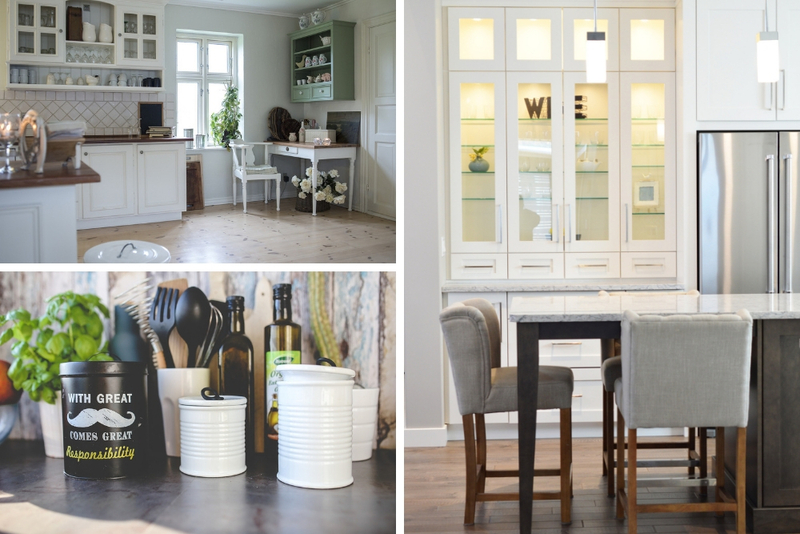 For smaller spaces and a real European look hidden storage is a real trend for the open-living plans. Pocket doors that slide seamlessly out of sight when the kitchen is in use, but cover up its contents when guests come calling. 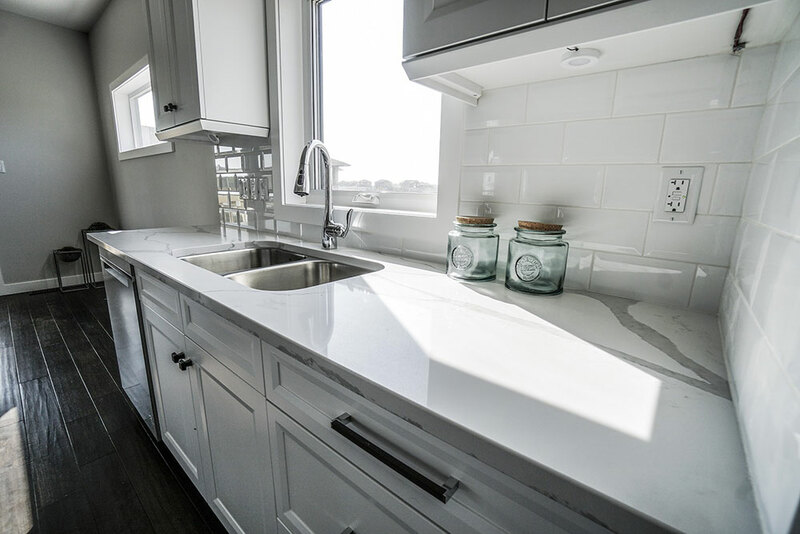 The kitchen can be transformed from an efficient work space to a clutter-free living environment in moments. 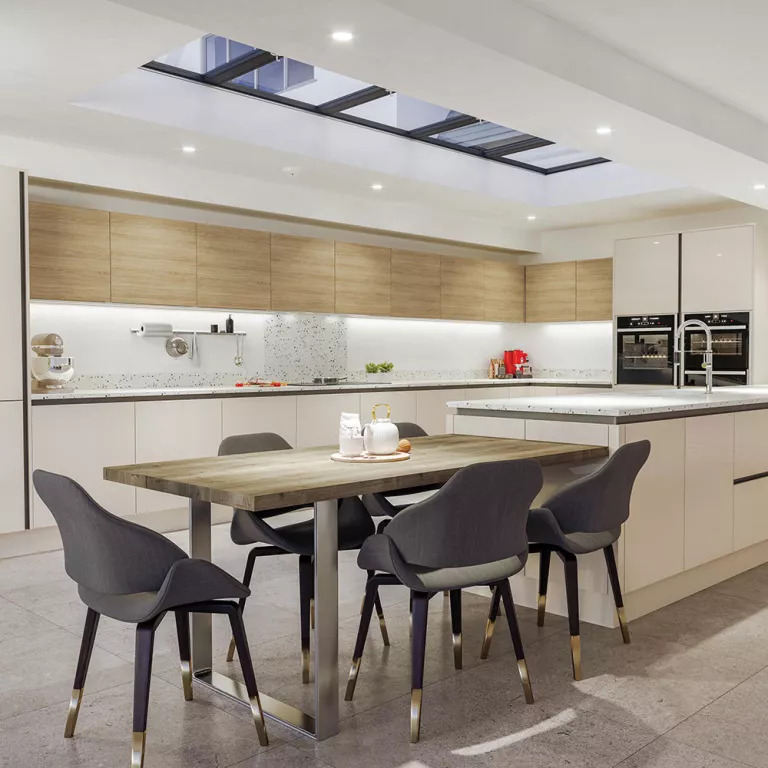 Open-plan kitchens have revolutionized the way we cook and entertain, but where do you hide all the dirty pots and pans from dinner guests? So if you’re after a little more privacy, broken plan might be for you. 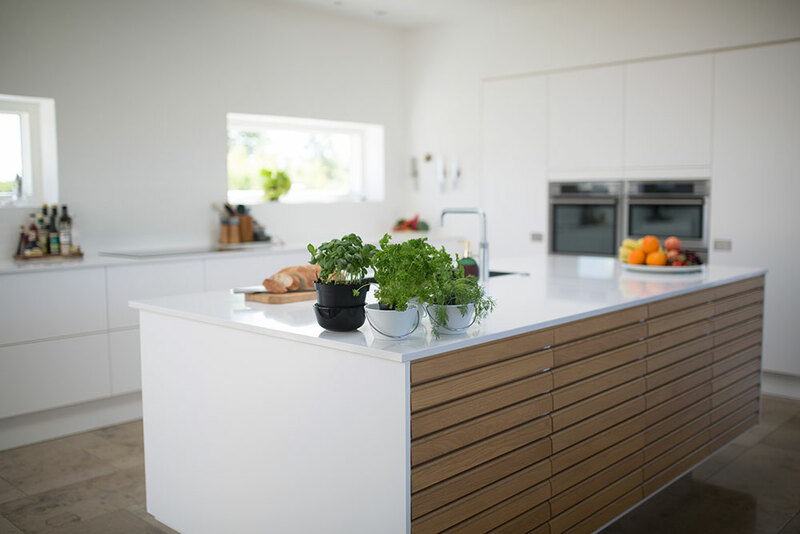 The concept is simple – take an open-plan design but add in a freestanding shelf unit or raised breakfast bar to create separation without the need for a full-on wall. The raw beauty of flawed finishes and natural materials was one of THE interiors themes of 2018. But for 2019 it’s being smartened up with luxe additions for a more grown-up look. 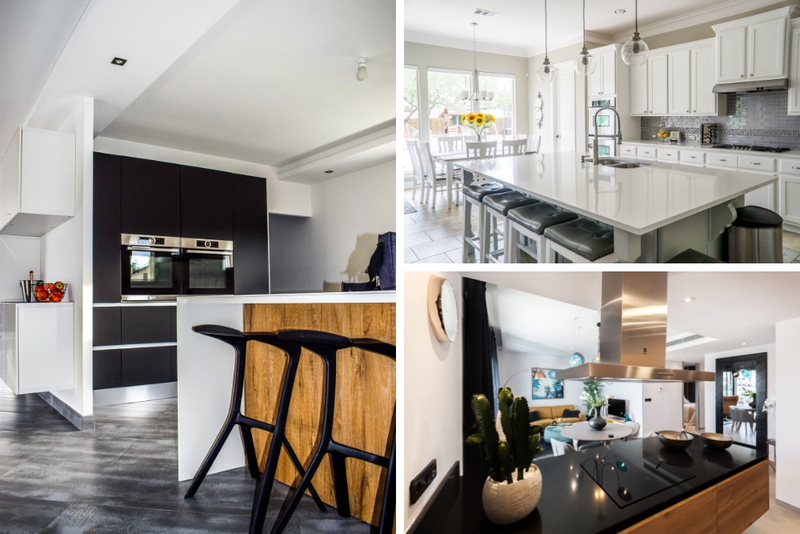 Nail the trend by pairing immaculate matt units with chunky wooden worktops, or by introducing shabby chic accent furniture to a glossy kitchen. If you don’t want to go for a full-on makeover, even artisan pottery or fabrics influenced by nature will do the trick.